L 16″ (41 cm) W 40″ (102 cm). Description: Sexes similar. 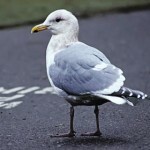 Breeding adults show dark brown hood, red bill and legs, pale gray back, black wing tips, and white underparts. 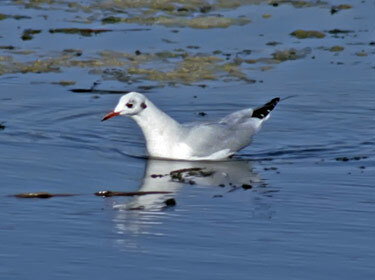 Winter adult lacks dark hood; has black spot behind eye, red bill and legs. First summer bird similar to breeding adult but has an incomplete hood. First winter birds and juveniles show a yellow bill with a dark tip, yellow legs, dark spot behind eye, no hood, and brown on wings. Habitat: Inland freshwater habitats and coastal regions. Where in Nebraska: Accidental. Seen at Walgren Lake, Sheridan County during August of 1979. Field Notes: An Old World species that has colonized eastern North America. 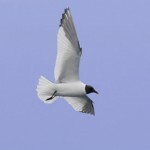 Fun Facts: Ironically, the Black-Headed Gull has a dark chocolate brown hood during breeding. 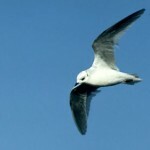 Other hooded gulls have black heads during breeding.